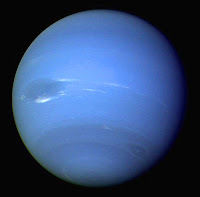 Corey S. Powell, the editor of Discover magazine, wrote recently about having to write a report on Neptune when he was a kid. He wasn't excited about being assigned Neptune, a much less interesting planet than the more vibrant Saturn and its fancy rings. But young Corey was a good student and dutifully began his research into this planet hovering on the outskirts of our solar system. And once he did, he found Neptune was not the ugly step-sister after all, but had its own charms. With a flash of understanding Powell realized that if he'd thought Neptune were dull and had discovered otherwise, the other planets might have secrets to be revealed too. It was a moment he could pinpoint in which his perspective changed. When I read this I thought how perfectly it sums my approach to the world. It's incredibly rare for me to be bored. I can generally find something interesting about almost any topic. When I hear someone talk about their passion - even if its not a passion I share - it's almost always interesting. I love to pick up a little tidbit here or there. One of my favorite areas in the library is the new books section. It's a mini-library and I can browse a wide variety of topics in just a few shelves - peeking into one world or another very easily. Somewhere along the way I discovered what young Corey did - that even though it may not be obvious at first blush, almost everything has some secrets to delight. They're just waiting to be discovered.